"Our goal is a world in which everyone is able to cover their energy needs with decentralised and clean energy source. Everyone can connect with each other to share energy where and when it's needed. This will emancipate our world from the dependence on fossil fuels and anonymous energy corporations"
The sonnenBatterie combines cutting edge technology with brilliant design. The sonnenBatterie has proven itself to be a product that homeowners can depend on. Combined with a PV (solar) system, the sonnenBatterie will cover your home for up to 80% of your energy requirement each year. You’ll enjoy a new sense of independence when you are powering your home through solar energy instead of an energy provider. Not to mention the money that you’ll be able to put back in your pocket with the savings on energy costs. Quality from the market leader: 10-year, 10,000 charging cycle warranty. Enjoy extra-long battery life. Safe and durable cell technology: Sonnen focuses on safety. That is the reason they use lithium iron phosphate cells. These cells are stable and durable. Safety and Longevity: You can rest assured knowing sonnen have the safest, longest-lasting storage solution in the solar industry. ‘Smart’ Battery: The energy management system automatically monitors and adjusts as needed – so you don’t have to worry about a thing. Mobile Monitoring: With the sonnenApp and web portal, customers can monitor and manage their energy usage. This also enables us to troubleshoot remotely, meaning we don’t need to worry about accessing your property to solve any issues. Minimal Environmental Impact: Sonnen batteries are made from eco-friendly products (95% fully recyclable). The longevity of sonnen batteries also eliminates the need to regularly discard and replace solar batteries. Guaranteed storage: Life of batteries under warranty is limited by the number of cycles during its operation. Most batteries will claim up to a 10-year warranty however they will limit the number of cycles under warranty. 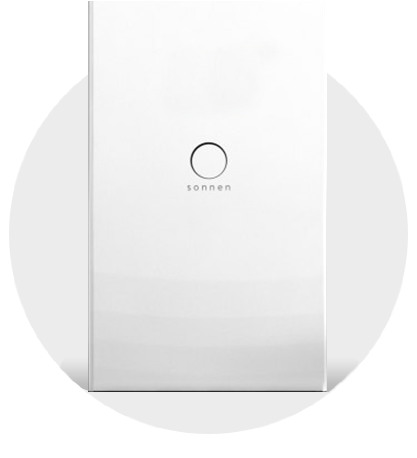 Sonnen offers a 10-year, 10,000 cycle warranty meaning they guarantee more storage than other battery brands. Intelligent Energy Management System: sonnenBatterie isn’t a simple battery – it constantly monitors and adjusts the charge/discharge ratio to best suit self-consumption. Dynamic load management: The energy management system means it will discharge to meet specific loads throughout the whole day, rather than just charge in the day to meet their night-time load. Home automation: The ability to set up control relays means sonnen can take charge of the big energy consumers and set parameters for when they are run. For example – the sonnenBatterie can be programmed to turn on your pool pump in the middle of the day when there is excess solar or heat the electric hot water or charge the electric car battery. Get a sonnenBatterie today: Contact Omega Solar+Batteries to purchase a sonnenBatterie and for any inquiry. If you wish to know if you can add it to your existing solar system our team will be able to help.